Feel free to edit the .xml file and adjust the "incomeValue" Do not make it too high as the game will go in-sync. 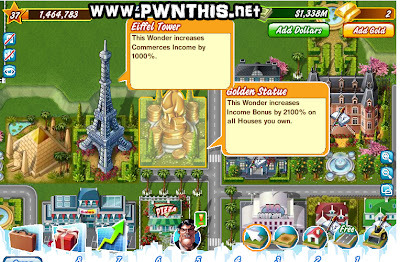 What this cheat does is, firstly you will need to have Wonders such as the "Golden Statue" or the "Eiffel Tower". We adjust the incomeValue so that you gain an extremely high amount of % bonus. You will be replacing this wonderDefinitions. Play the game normally and when you cash in, you will get A LOT more money based on the % of bonus income your Wonder building is giving.